Happy Monday everyone! For our fellow Canadians, Thanksgiving is just around the corner, and I've got a drink that's perfect for early holiday season entertaining. I wanted to make a fall inspired drink that would be perfect as we slip into the cooler months but every recipe I found required a special liqueur or ingredient that I didn't have on hand. So, when I stumbled upon this recipe I was thrilled that it was made with ingredients I not only had - but most of you probably have too. I changed it up just a little bit to cut a few calories and adjust some of the ratios to my taste and I absolutely love it - and am sure you will too! *To make cinnamon simple syrup boil 1 cup of water with 4 cinnamon sticks then let simmer for 15 minutes. Remove cinnamon sticks and add 3/4 cup of sugar and bring to a boil. Once sugar has dissolved let cool. Start by mudding 3 blackberries in the bottom of a glass. Add the syrup, juice, perrier and ice then top with citrus vodka. 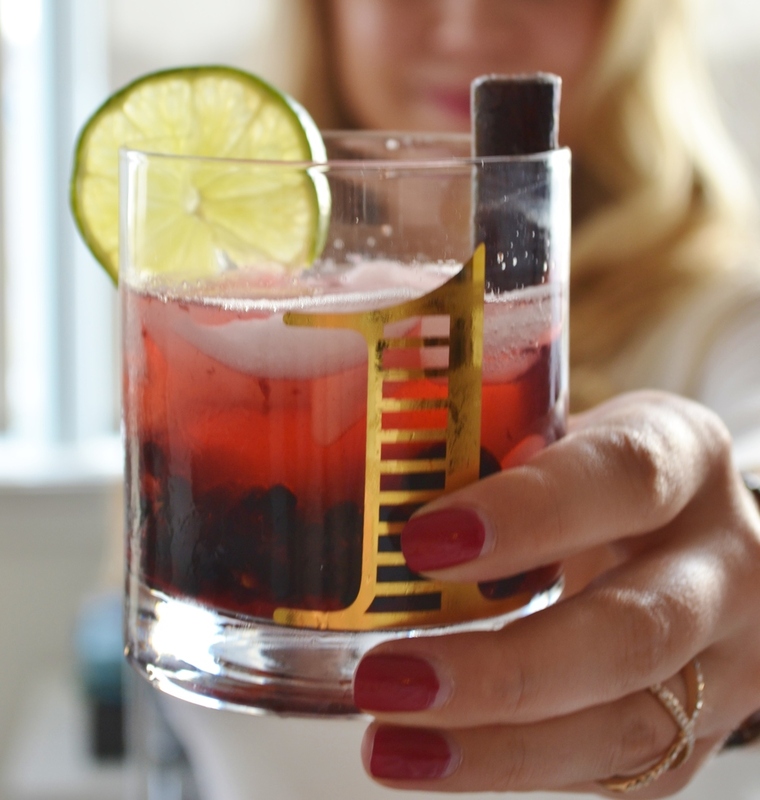 Garnish with a lime, blackberries and a cinnamon stick. If necessary, add additional soda to taste. I actually loved the unexpected combo of the citrus and cinnamon and found this drink so easy to make. This is definitely going down as one of my new favourite drinks!